When it comes to their Beats headphones, they have a premium high-end version -- Studio Beats 3. Even looking solely at their wired Apple-branded earbuds they've offered a more high-end version. 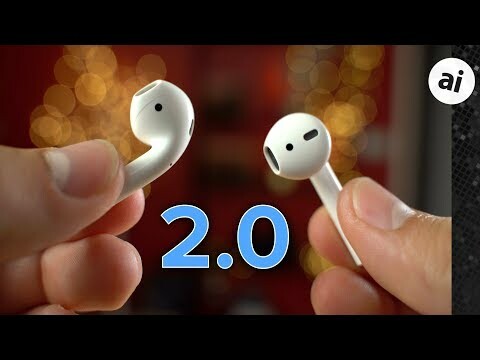 I and I'm sure many others would likely consider upgrading their existing "first-generation" AirPods if a new V2 model is introduced possibly -- but not likely -- tomorrow. It would be extremely disappointing to upgrade, only have a pro model in the wings for a few months later. They've held up well over the past two years, but it is time for Apple to do more. I think they will -- but perhaps not this week, unfortunately. Lost in the shuffle are those in-ear headphones that Apple is still(!) selling. https://www.apple.com/uk/shop/product/ME186ZM/B/apple-in-ear-headphones-with-remote-and-mi . If it's true that they sound better than Earpods (the consensus seemed to be that they did, but not by much), then higher-end Airpods would probably follow that design. Which would be nice for the people with ear canals that fall on the two-big and two-small sides of the fit bell curve. but IMO, it's more likely that the future of the line will be vanilla Airpods as the mass-market choice, and the Beats line for color, audiophile, and other variants. AirPods are $139 everyday at Costco. No need for coupons from online retailers. So, AirPods Pro or AirPod Pros? AirPods are $139 everyday at Costco. While I do hope that they introduce a version of the AirPod with active noise-cancelling, I do not expect Apple to enter the realm of ultra-high-end audiophile headphones. It simply not what they do well. A very good (maybe not the world's best) sounding headphone with the thought-out design and ease of use of the current Air Pod is where they should be. It's $153 with tax at Costco, plus $60 a year. That's a good idea! Why stop there though? How about gesture support. Swipes up and down as well as triple tap support? Thanks in part to your review of them, I picked up a pair of MW07s and haven't used my AirPods since. Yes, audio quality is a huge step up from AirPods, but that's only a part of the story. For many people like me, the fit of Apple's EarPods/AirPods has never been great, with a tendency for one or both pods to fall out regularly. Those days are over with the comfortable fit rings on the MW07. In addition, they provide a better seal of the ear canal, resulting in much improved bass response--better than you'd ever imagine from an ear bud--and physical isolation from outside noise. You still have enough audible awareness of sound around you, but I can now listen to music at lower volumes since I don't have to blast it over all the exterior noise you hear with AirPods. And finally, the convenient switches on the earbuds themselves--one for volume up/down, the other a multi-purpose switch--are the perfect blend of small/discreet while still being easily usable. Yes, there's the $299 price to consider, but you get a two week trial if ordered directly from Master and Dynamic--just be prepared not to send them back! If memory serves, there wasn't much mentioned with regard to the performance of the microphone on those. So how is the mic? Do they work well for calls or for engaging Siri? Most of these wireless headphones are complete rubbish when it comes to microphone quality. From the calls I took, the mic was fine. Not anything amazing but no complaints. I didn't take many calls because they seal your ear so well I couldn't tell how loud I was talking. I could put in at a time though which helped. 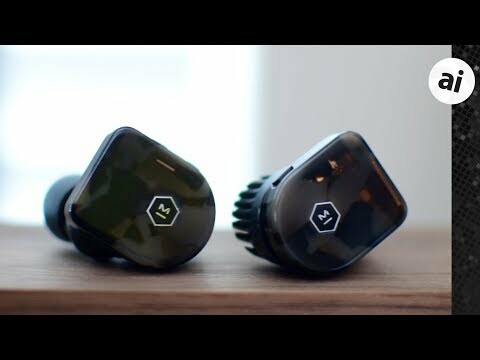 It was a little jarring for me compared to AirPods where they let so much ambient audio through I could hear myself better while talking. I would pay extra for the ability to use airpod internals with a silicone impression of my inner ear, similar to high end custom molded earplugs and hearing aids. No tax ... if you're willing to break the law. If you live in a state with sales tax, and a retailer doesn't collect sales tax from you, you are legally required to remit the tax yourself. Sure, nobody does it, but it is the law. This is an excellent point. The microphones and noise cancellation in AirPods are stunningly good. I currently drive a rear-mid-engine sport car (so the engine is maybe 2' away from my head). When I've used AirPods, nobody on the other side of a call has been able to tell I was driving, even when I have the top removed, windows down, and I take the engine up above 5k RPM. When I do that, it gets so noisy I can barely hear the other person, but they hear me perfectly. It's weird. Thanks for this. It sounds like the AirPods would be good for my particular use case. My only concern is that they would not stay in my ears while working out. I'm currently using a pair of $40 cheapy bluetooth headphones from Amazon. The sound quality isn't anything to write home about, but I don't expect it to be for a wireless connection. My wife has the same experience. She used to use the Beats in ear, and I always found it hard to hear her in the car with the top down on the highway. Trucks rolling by made me take my buds out while talking to her, it was so bad. She started using Airpods, and it's like she's not even moving. She apologized once because a truck went by - I didn't even notice until she mentioned it, but it was barely louder than a gust of wind in my ear. If the Apple wired ear pods fit well in your ear, then too will AirPods. If they don't, then neither will the Airpods. My wife can not use either, due to her tiny ears (so she claims). For me they fit great and have never come out.